Dave's Services A/C & Heating is proud to serve the Vandalia community! We are proud to be part of this community, serving your heating and air conditioning needs. Whether you need repair, replacement or a new installation of a furnace, air conditioner, heat pump or air filtration system, we get the job right the first time. Our certified technicians service all furnace and air conditioning make and models. Please call us today at 937-335-1423 to consult with our home comfort specialist. I was very impressed and pleased by the sales and installation teamwork. Also, I don't give my own employees a full 5 review because I believe there is always room for improvement but this time I couldn't find any...way to go! I have used Daves services in the past and have always been pleased! They get me in quickly, and the customer service is great. Prices are very competitive. We will continue to use Daves in the future. About Vandalia, OH - Happy to be your hometown Heating & Air Conditioning Contractor! 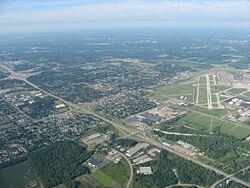 Vandalia is a charming town in Montgomery County, Ohio which approximately 16,000 residents call home. It’s perfect size community for raising a family. Kids love to watch the seasons change as the town’s warm springs and summers give way to cold, snowy winters. To an outsider, this town seem sleepy. The area is certainly not an urban environment but all around Vandalia you will find that there is a great deal to see and do and you might just be surprised! Vandalia, itself, has some pretty interesting architecture which varies from Colonial to post-modern. The town is home to some very significant architecture. Nearby Sidney is full of character, charm and history with some very stunning buildings that you simply cannot miss if you find yourself in the area. A short drive from Vandalia is all it takes to will find the 1918 early-modern People's Federal Savings and Loan Association (which is a national historic landmark) and many more. In addition, The Big Four Bridge is a local landmark that has been carrying trains for almost 100 years. Check out the exterior of these buildings when it is warm and tour the indoors when it is cold. The City of Vandalia holds many events annually. Seasonally, these events change and you can enjoy the best of each time of year. The annual Oktoberfest and the Homecoming parade in autumn as well as an Air Show & Parade in the heat of the summer. The Star-Spangled Celebration, fireworks, “Taste of Vandalia and the Vandalia Fair are all awesome family-friendly activities, as well. Other events include "Taste of Vandalia", a culinary event, and the Vandalia Corporate Challenge. In 2013, the town worked to bring a farmers market to Vandalia. Each year, during the warmer months between June and September, the market is held in Seger Park on Fridays. It is a great way to end a long week! Enjoy the nice weather, chat with local farmers and try delicious, fresh produce. It’s the perfect way to spend a Friday evening for a family or for anyone who loves great food.